Men, you are the solution. Think about your behavior towards women at work and in life, be cognizant of power dynamics, and if you see something, say something, when it happens. Another week another explosive report of a man in power behaving badly, or possibly criminally. I hate to burst your bubble, but I’m old enough to remember previous versions of this story. Back in 1991 Anita Hill, at great risk to her reputation, spoke publicly about inappropriate behavior by Supreme Court Justice nominee Clarence Thomas when they worked together. In 1992, the Washington Post reported on a long history of sexual misconduct and inappropriate behavior by Republican Senator Bob Packwood. It took three years before he resigned, only after a Senate Ethics Inquiry which revealed extremely explicit details from his personal diary. But read this story about the lengths the Senator went to in order to discredit the women who were speaking to the reporter, and how Anita Hill’s treatment actually made some of them wary of speaking out. You’ve lived through these stories too—Bill Clinton, Bill Cosby, Roger Ailes, Bill O’Reilly and now Harvey Weinstein. Let’s not forget, of course, the allegations against the current President of the United States. The details are appalling; the infractions were well known by people in the orbit of the man and they may well have been complicit in enabling such behavior. What they all have in common, of course, is that they are men in power with access to money and influence. They can spread stories about these women (allegedly this was one threat Weinstein used effectively, presumably with the assistance of the gossip columns that rely on these relationships with people in power). Monica Lewinsky was labeled a ‘narcissistic loony toon’ by Hillary Clinton and Anita Hill ‘a little bit nutty, a little bit slutty’ by David Brock which he has since recanted. Candidate Trump trashed the looks of his accusers during the campaign in an attempt to discredit their stories. With every episode we think something will crack, that we are on the cusp of change, that the floodgates have opened and we will now see structural change in how women are treated. Sadly, we haven’t moved particularly far. While Hollywood is financed and produced and directed by an overwhelming majority of white men, even Harvey Weinstein’s transgressions are unlikely to unleash a revolution in behavior or opportunities for women. The fact of the matter is, that as long as the inequity between men and women exists in the boardrooms, and the legislative assemblies, and the media and the military and academia and Silicon Valley and every facet of American life, women will be subject to harassment of this kind. In a report released this week about women in the workplace by consulting firm McKinsey and the Lean In Foundation, it is clear that women have a long way to go reach the upper echelons of leadership let alone parity in corporate America. And as long as the onus is put on women to somehow come up with solutions or change their behavior so as not to put themselves in a vulnerable position, not much will change. The solutions to this problem do not reside with women changing what they wear (talking to you Donna Karan); or not going to an after work event if they are the only woman; or going to business meetings in pairs; or not taking a meeting in a hotel when so much business is conducted in hotels; or going to HR to report such behavior (HR works for the corporation not for the staff); or acting like a man in order to advance. Men, you are the solution. I ask you to think about your behavior towards women in your workplace and in your everyday life; be cognizant of power dynamics if you are the boss; if you see something, say something, when it happens; if you are on a corporate board – start really digging into what the company is spending its money on (payoffs from Fox and The Weinstein company apparently did not arouse any queries); if you hear rumors about behavior think about why you might be hearing them. And by the way, don’t be rude. Please, don’t do this because you have a daughter (talking to you Matt Damon). Do it because it is the right thing to do to treat women with respect and courtesy and because frankly when you don’t you are missing out on a whole lot of talent in the world. 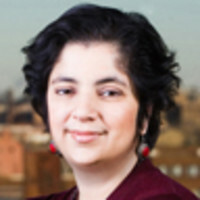 Madhulika Sikka is former Executive Editor of NPR News.